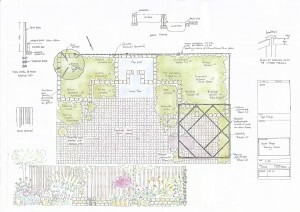 An individual pricing schedule with be drawn up for each garden design. However, as a guideline below I have developed various options to assist you with your budgeting. Please remember that these prices are for the garden design only and do not include – professional survey fees; materials and construction contractors’ fees or plant purchasing and planting. The maximum size the garden can be is 50 metres square. I will arrange to undertake some basic measurements; interview you to understand your desires and preferences. Using this information I will draw-up a hand coloured outline design plan for your approval. We will discuss your desires and preferences for the garden taking into account the information gleaned from the survey. I will use this information to create an outline coloured design for your approval. On completion of either Option One or Two the design can be enhanced with a fully worked up detailed plan, construction plans and planting plans listing structural shrubs around which your choice of other plants can be made. This option can also extend to include some detailing on the construction methods required to build your garden features. For larger and more complex gardens, such as those requiring significant hard landscaping or to cater for differences in levels within the garden an individually developed fee structure will be agreed. This is likely to include obtaining the independent services of a Landscape surveyor (Priced separately). 3-D models and Computer Aided Designs (CAD) are available upon request, at additional cost. If required I can assist with the sub-contracting of landscapers to complete any structural work and act as project manager for the process. This will be charged on an hourly basis. I am also able to provide a planting service and on-going maintenance should you wish.